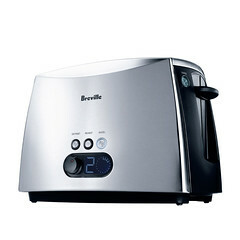 The Breville ikon 2-Slice Toaster — Lift And Look control for perpetually perfect toast. Check toast without canceling the cycle. Defrost and Reheat settings for perfect results. Self-centering carriage positions your bread perfectly between the elements for even cooking every time. A. Extra Wide and Deep Self-Centering Slots. 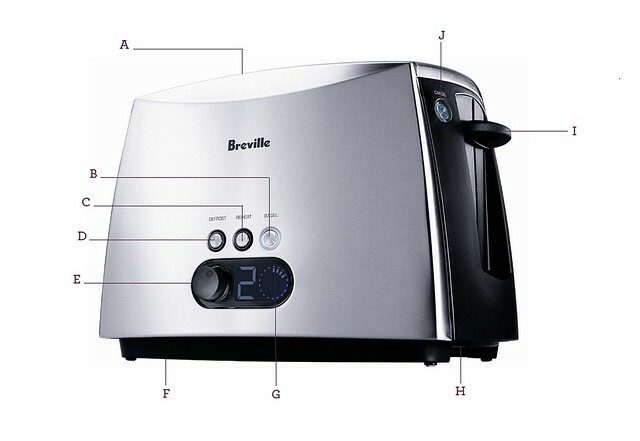 B. Bagel Control Setting. C. Reheat Setting. D. Defrost Setting. E. Electronic Browning Control Dial. F. Cord Storage. G. LED Display With Toasting Progress indicator. H. Removable Crumb Tray. I. Height Lever with 'Lift & Look' height and 'High' height. J. Cancel Button.